Laura Gilbert, a double major in Spanish and Linguistics, is traveling to Brazil to assist teaching university-level English foreign language courses. 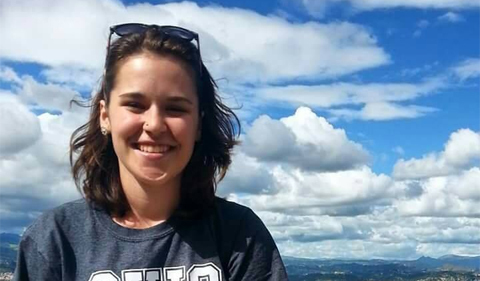 She is one of seven Ohio University students selected for the prestigious Fulbright U.S. Student Program Award, the largest U.S. educational exchange program sponsored by the U.S. Department of State’s Bureau of Educational and Cultural Affairs. “I had already planned to teach English as a foreign language after graduation, and Fulbright was a great opportunity to gain more teaching experience as well as integrate into a new community abroad and practice a foreign language,” Gilbert said. In addition to teaching, Gilbert will prepare for a national Portuguese proficiency exam, CELPE-Bras, while she is abroad. She will complete CELPE-Bras near the conclusion of her grant. Gilbert, whose reaction to being selected for a Fulbright award was shock and joy, encourages all OHIO students to consider applying for a Fulbright grant opportunity. Read about all seven OHIO Fulbright students.